Standing as a testament to the process of time and nature, the Grand Canyon is a landmark that has to experienced rather than seen. While the scenery there is astounding at any time of day, there is something rather beautiful about viewing a sunset from the Canyon. From the Canyon’s West Rim you will be able to enjoy an offering of colours, which are constantly changing on the canyon walls, creating twilight glows for an enchanting evening. 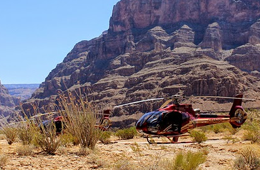 The best way to experience a magical sunset and the spectacular views in style is to take a Grand Canyon West Rim Deluxe Sunset Helicopter Tour. Your trip starts with a limousine drive from your hotel to the airport where a helicopter will be waiting for you. 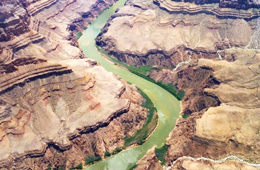 The flight will take 45 minutes from Las Vegas to the Grand Canyon, but there will be plenty to see along the way. You will fly over Lake Las Vegas, Lake Mead and the mighty Hoover Dam. Along the way you will be able to listen to a commentary about the Grand Canyon and surrounding areas through headphones. Although, don’t be afraid to ask your pilot any questions as he will be more than happy to answer you. When you land in the Canyon you will be treated to a champagne picnic, while enjoying the changing colours of a Grand Canyon sunset. Once the sun has set you will then be flown back to Las Vegas, where you will see the astounding views of Las Vegas at night. While not a natural beauty like the Canyon, the lights of the Las Vegas strip are still an amazing sight to behold, especially from the air. 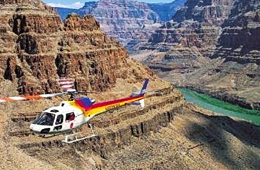 As this tour only operates once a day, it is always best to book your Grand Canyon West Rim Deluxe Sunset Helicopter Tour in advance so you don’t miss out.